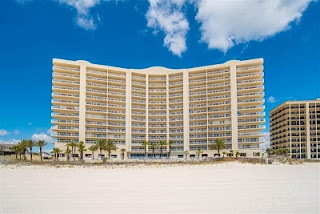 Admirals Quarters beachfront condo for sale in Orange Beach AL. This 2br/2ba gulf-front property with 1,520+/- sq. ft. is a must see - be captivated by the direct views of the Gulf of Mexico from this 9th floor beach resort home. Ideal as a second residence and/or real estate investment. High ceilings throughout give this condominium an open feeling....numerous upgrades such as granite counter-tops in the kitchen and bathrooms, a walk-in shower in the master bathroom and a jetted tub. The large, private balcony has direct access from the living room and master bedroom - private storage and a deeded parking space are included. Don't miss your chance on this one! Orange Beach is a coastal community situated between Gulf Shores and Perdido Key, and boosts the largest charter-fishing fleet in the Gulf of Mexico. Orange Beach has miles of white-sand beaches and numerous public parks; inland bays and bayous just north of Perdido Pass provide for ample water-sports and outdoor activities.